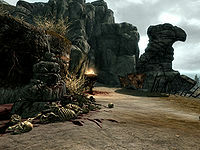 Rebel's Cairn is a cave located in The Reach between the Sundered Towers and Bleakwind Bluff. Picking up Red Eagle's Fury in Sundered Towers, adds the location to your map. In the immediate first room lies a dead adventurer clinging on to a copy of The Legend of Red Eagle. Reading the book starts the related dungeon quest, Rebel's Cairn. It also contains 2 lavender plants, 2 Nordic barnicle clusters, and 1 slaughterfish egg nest. From the entrance, 1 iron ore vein is located on the right side of the room with the pedestal. Red Eagle's sword can be removed from the weapon stand at any time but doing this will cause the secret door to close. If you interact with the weapon stand when you do not have Red Eagle's sword in your inventory nothing will happen and a message will be displayed in the top left-hand corner of the screen saying "None of your weapons fit in this slot." It will vanish in a few seconds. 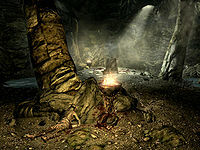 If you are sent to Rebel's Cairn by a radiant quest, it is generally impossible to complete the quest unless you first start the Rebel's Cairn quest, allowing you to enter the dungeon. If the Rebel's Cairn quest has been completed, you may want to keep Red Eagle's Bane to reenter dungeon and complete the radiant quest without having to find Red Eagle's Fury again. There is a steel sword stuck in the top of a pile of rocks to the left of the entrance. This page was last modified on 17 October 2017, at 10:44.